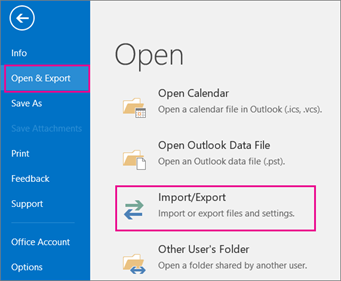 There are several reasons why you might want to import Outlook items from an Outlook Data File (.pst). 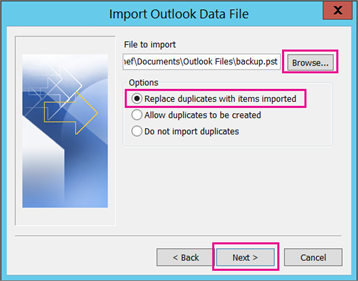 You want to move Outlook items between local folders and an IMAP or Exchange server. 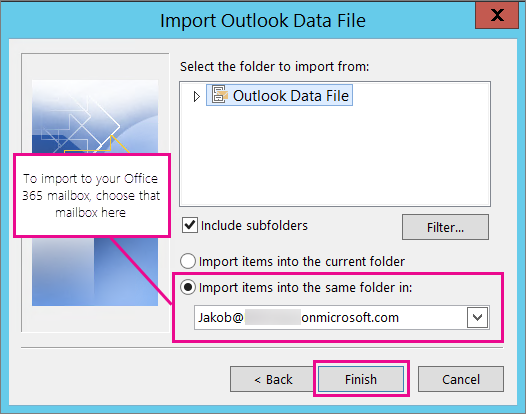 These instructions assume you’ve already exported your Outlook email, contacts, and calendar from another instance of Outlook, and now you want to import them to Outlook. At the top of your Outlook ribbon, select File.If your ribbon doesn’t have a File option in the top left corner, you aren’t using an Outlook app installed on your computer. See What version of Outlook do I have? to find your version of Outlook and to get to right import steps. Select Open & Export > Import/Export. This starts the Import/Export wizard. Select Import from another program or file, and then click Next. If you’re importing the contents of your .pst file into your Office 365 mailbox, choose that mailbox here.If you’re NOT importing into your Office 365 mailbox, choose Import items into the current folder. This imports the data into the folder currently selected. Choose Finish. Outlook starts importing the contents of your .pst file immediately. When the progress box disappears, the import is finished.If you’re importing your .pst file to your Office 365 mailbox, you may see a message that it’s trying to connect with Office 365. This happens when the Internet connection is interrupted, even for a moment. Once your Internet connection is re-established, Outlook will continue importing the .pst file. Tip: If you want to retrieve only a few emails or contacts from an Outlook Data File (.pst), you can open the Outlook Data File, and then, in the navigation pane, drag and drop the emails and contacts from .pst file to your existing Outlook folders. 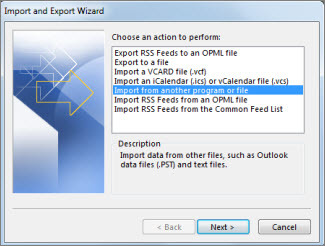 .Pst files are created when you export or back up email, contacts, and calendar to an Outlook .pst file. Outlook makes a copy of your email to the .pst file. When Outlook exports emails to a .pst file, it includes any attachments. So, when you import a .pst file, you’ll see your attachments. Outlook does not export meta-data such as folder properties ( views, permissions, and AutoArchive settings); message rules; and blocked senders lists. So, they won’t be imported, either. When Outlook exports email, contacts, and calendar info to a .pst, it makes a copy of the information. Nothing is deleted from Outlook. You’ll still see and have access to your email, contacts, and calendar in Outlook.